In the beginning, many questioned whether or not an intervention by the United States, along with other ally forces, would help the situation in Libya. As Gadhafi’s reign of terror continued as he mercilessly killed his own people, it became ever more obvious that the United States had to step in to protect the innocent people. Just about as quick as it took for the French fighter jets and the American and British warships to launch their first salvos on the Libyan military posts, the Libyan leader, Moammar Gadhafi, has called for a cease-fire and an end to the violence. However, civilians claim that the cease-fire is not a reality. There are still reports coming out of attacks in various locations in Libya. Although the attacks are not necessarily coming from the Libyan military via Gadhafi’s orders and are instead likely coming from his followers, the attacks are still going on. The overall goal of the American, British, and French alliance is to gain stability in Libya so the United Nations can bring down orders that would lead to the safety of the Libyan people from Gadhafi and his murderous ways. Based on the reported cease-fire by Gadhafi and the decrease in violence, it appears that the work done by the allied forces has been successful thus far. There have been no reports of Libyan planes in the sky and no reports of official attacks by the Libyan military forces since Saturday when the American, French, and British alliance came to the state. In addition to the three western state powers, Spain, Denmark, and Italy also sent over military jets to fly over Libya to make sure that the no-fly zone was not being violated by the Libyan government and military. Monday saw soldiers from Canada and Belgium come over to help the effort as well. It is perfectly clear that the feelings of the United Nations are unanimous. 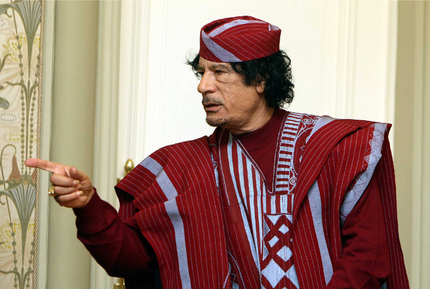 Gadhafi has abused his power and lost the legitimacy to be the leader of the Libyan people. It is true that some feel that the international involvement was unwarranted and that the conflict in Libya was between the people and the government. However, once Gadhafi began to kill his own people and did so in an insensitive way that showed no compassion for human life, the United States and the other members of the United Nations had no choice but to interfere in order to save human lives.